My wife, Kelly, and I got married at North Hills Country Club in Menomonee Falls on September 24 and left Wisconsin the following Monday for South Carolina for a much needed and enjoyable honeymoon. The deal was that I would get to play two rounds of golf on our honeymoon. 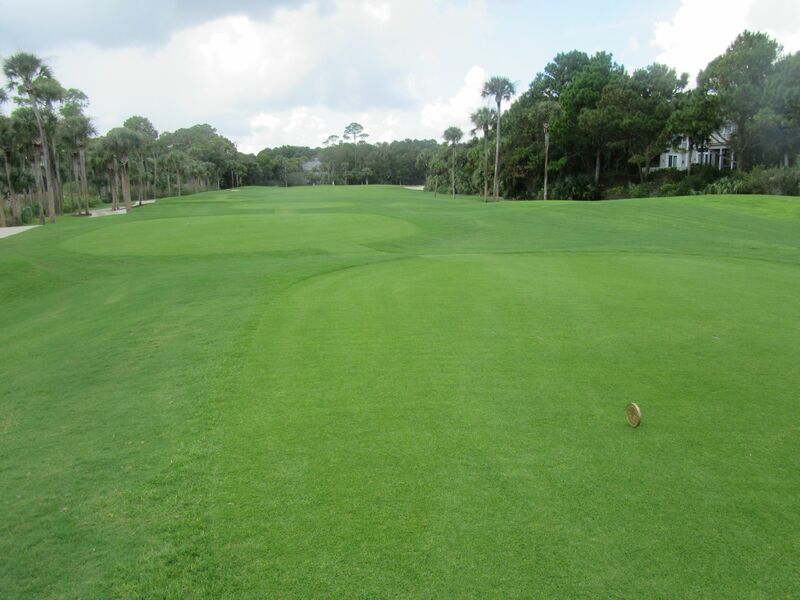 I took full advantage with rounds at the Ocean course and Osprey Point. 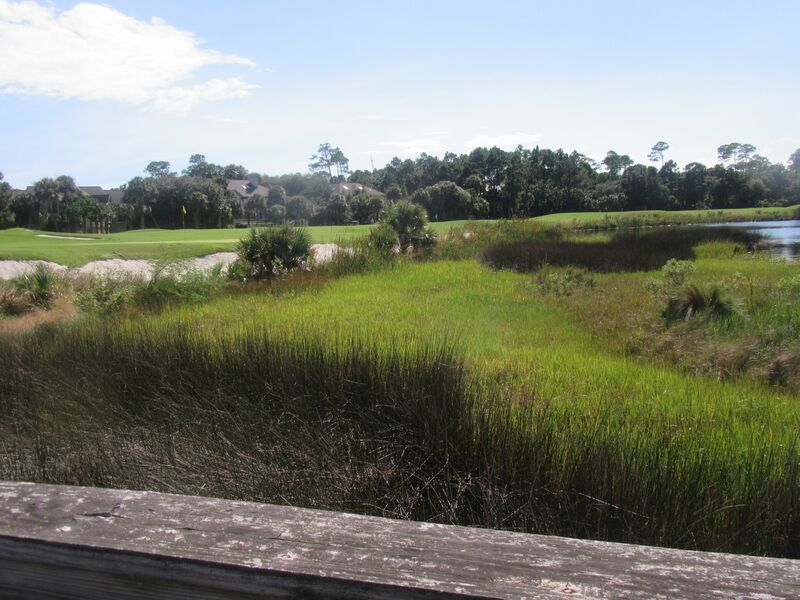 When it comes to Kiawah Island Golf Resort, anyone and everyone thinks of the Ocean course, and why not? It is one of the top five courses in the country and literally one of the greatest in the world. The Ocean course has also held almost all of the professional and amateur majors that exist, and they have all been seen on national television. Not only have their events been nationally televised, but they have been replayed habitually because their outcomes have been monumental. Our original honeymoon plans were to go to Punta Cana, Dominican Republic. Considering the Zika virus scares, we decided to change our plans to somewhere more domestic where the virus doesn’t exist. South Carolina was the perfect destination. 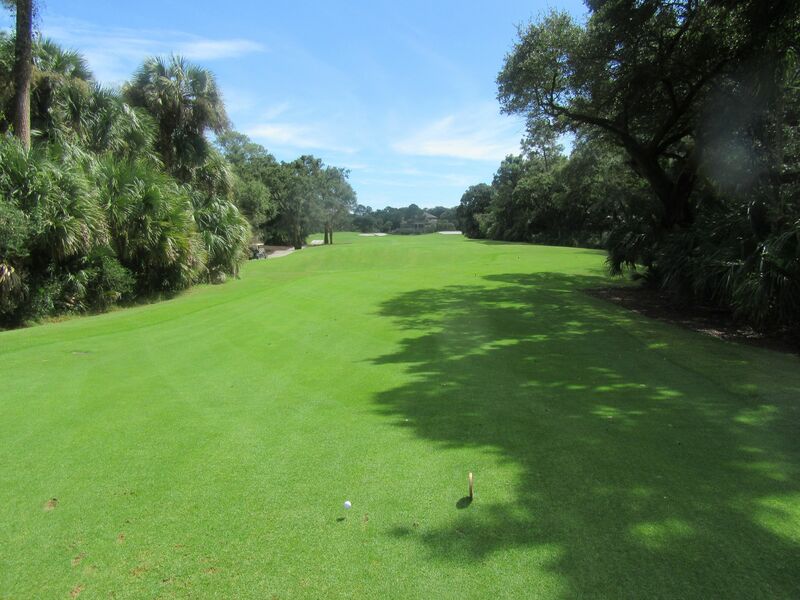 Neither of us had been to Kiawah Island or Charleston, though we’d both heard a million great things about Charleston [and I, as a golf writer, obviously have heard a billion awesome things about Kiawah Island!]. In as few words as possible: Our honeymoon in South Carolina was wonderful. We spent five nights on Kiawah Island and two in Charleston, and we experienced nothing short of amazing dining, shopping, spa and overall experiences at both. 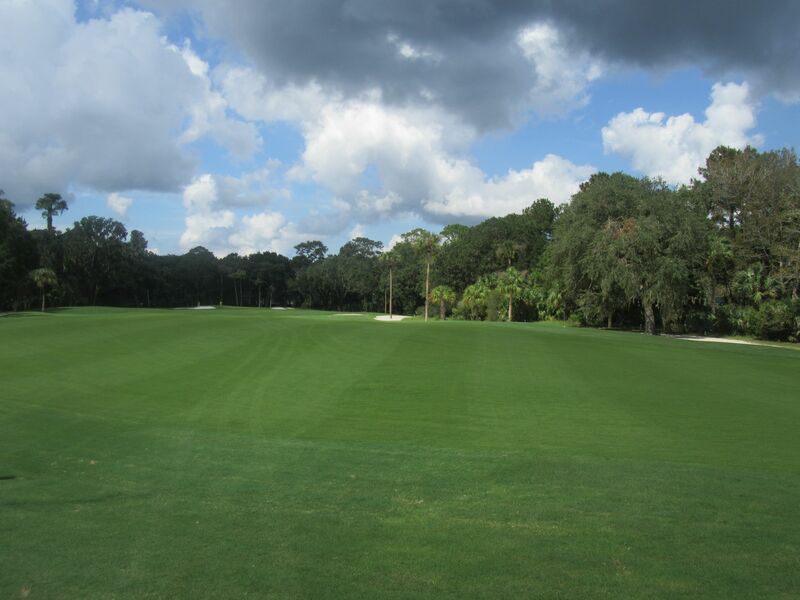 When we arrived at Osprey Point, Kelly and I spent quite a bit of time in the pro shop so I could get my standard logo golf ball, ball marker and flag, as well as a couple of polos, and then made our way out to the driving range where I had enough time to hit about 15 balls. It’s interesting when you’re pressed on time at the range. I usually don’t go to the range at all, but if I do I like to hit a couple of wedges, then a few long irons. I hit several shots with my even-numbered irons before our round and everything felt good – all systems go! We met up with our playing partner for the day, Tom, who retired to Kiawah Island a couple years ago following a career as Physician at the Cleveland Clinic and many years spent as the team doctor of The Ohio State Buckeyes. We had some great conversations about the 90’s and 2000’s football teams – my wife, Kelly, is a Wisconsin grad and I’m a huge fan even though I went to UW-La Crosse (UWL is a D3 school, and everyone there is a UW fan). We were incredibly fortunate with our playing partners for both rounds on Kiawah Island, and enjoyed our time with Tom tremendously. 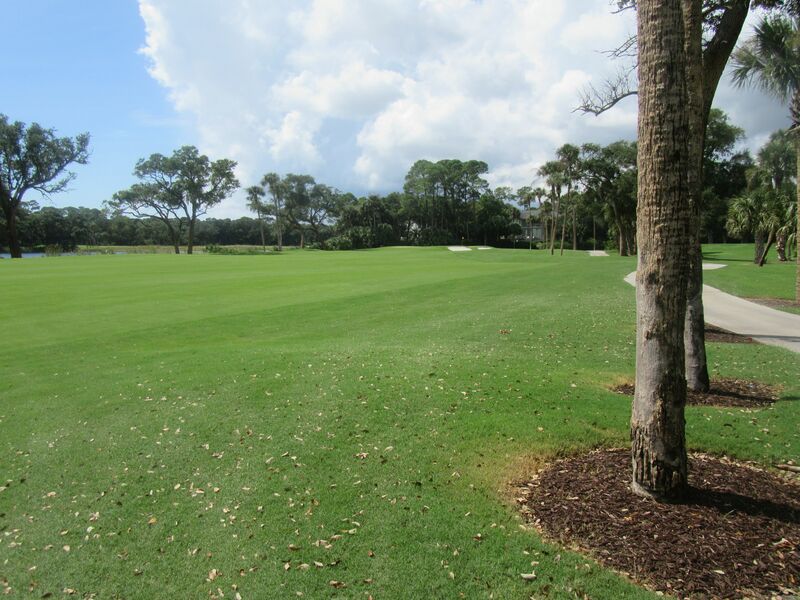 The first hole on Osprey Point starts out with a straightaway par four – long, but straight. 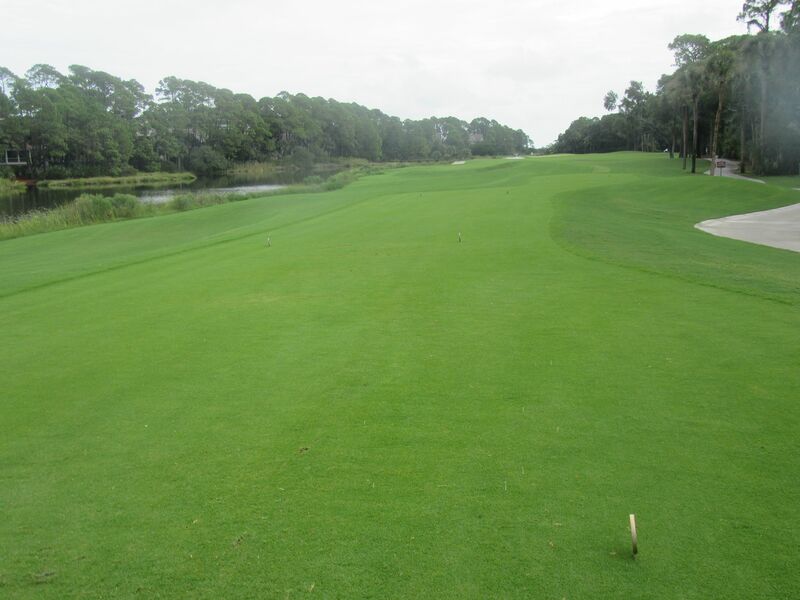 Water lines the entire left side of the fairway, and woods creeps in along the right side. Keep the drive straight here and everything will be pretty straightforward. 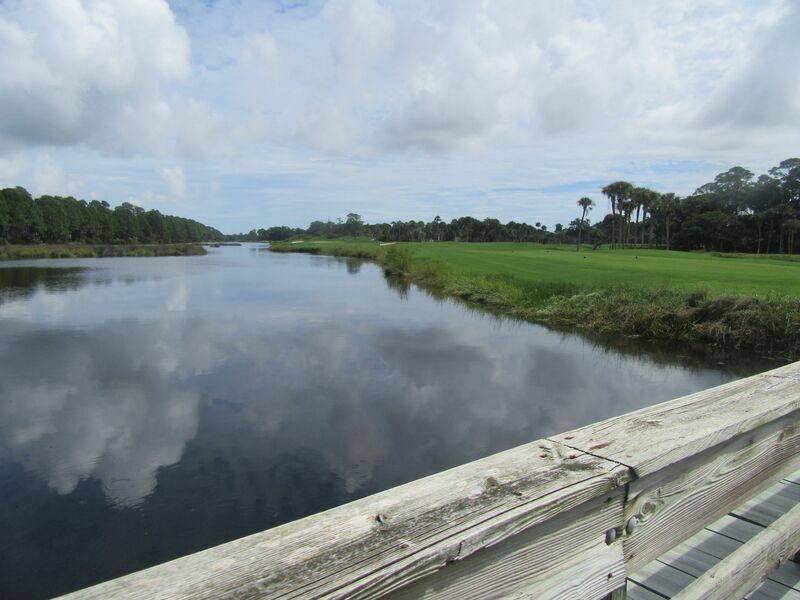 I love being along these waterways – everywhere you look there is wildlife, and on the first hole we saw a number of gators cruising the thoroughfares (for example, below). This was my first time playing the new Snell MTB golf balls, and I brought one sleeve with me for our round. I took a breakfast ball off the first tee [and found the initial tee shot], but then really drop-hooked my drive on two. 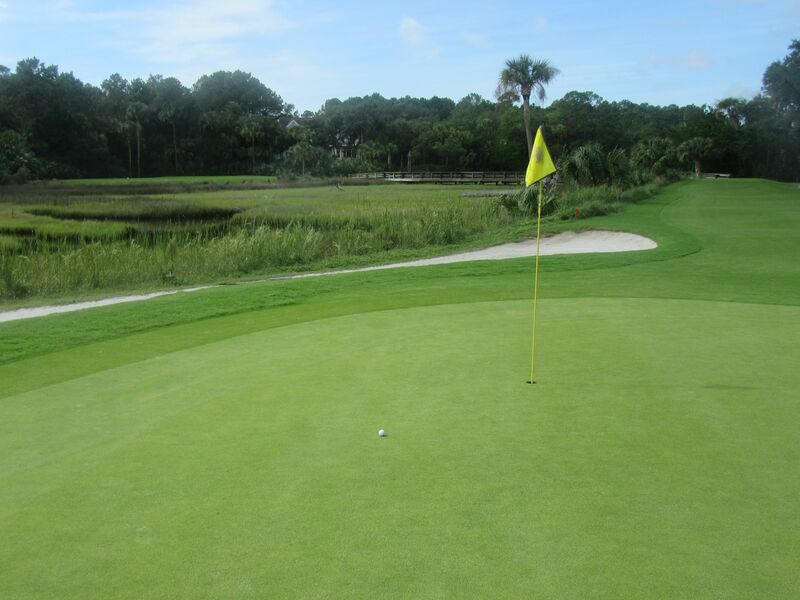 Of almost any hole on the Osprey Point course to duck-hook a ball, the second might be the worst. Gone. Teeing up a third shot to start things off on two. 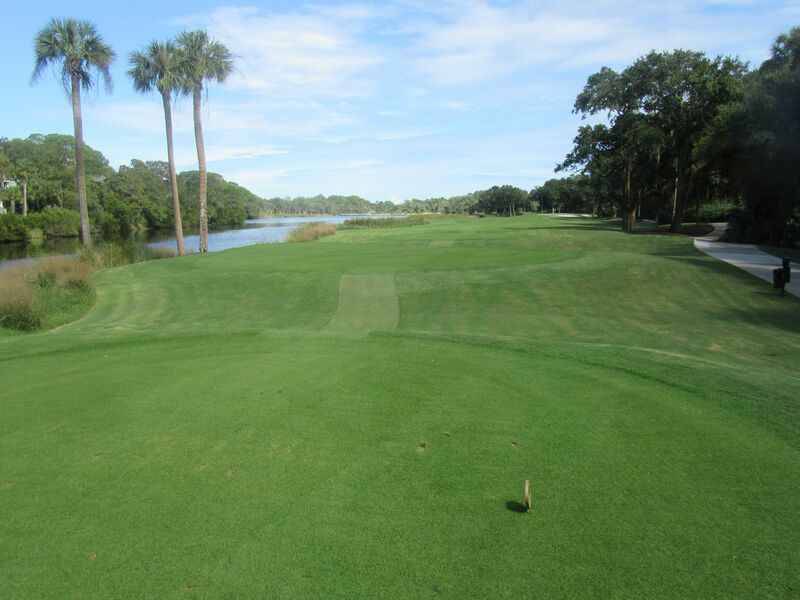 The second shot plays over water that runs the entire length of the fairway, while trees and houses make up the perimeter on the right side. 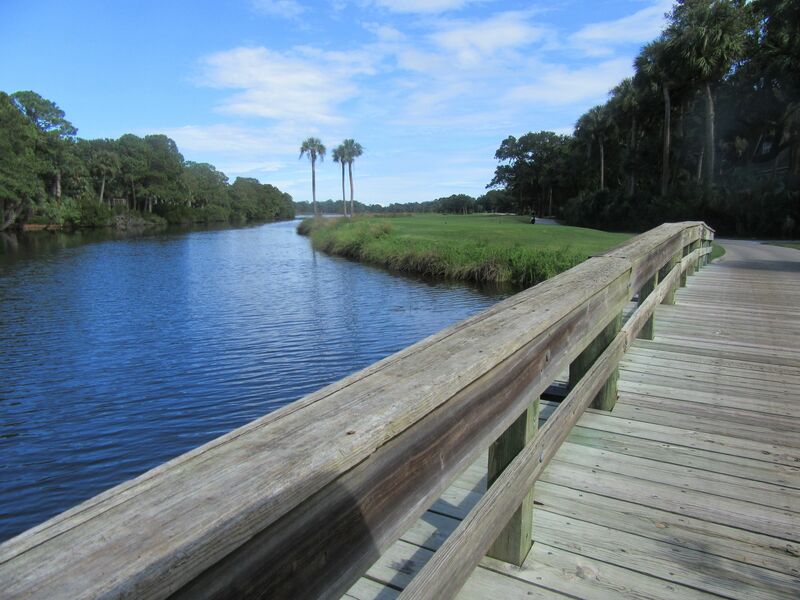 While there are plenty of beautiful homes at Osprey Point, they do not interfere with play. 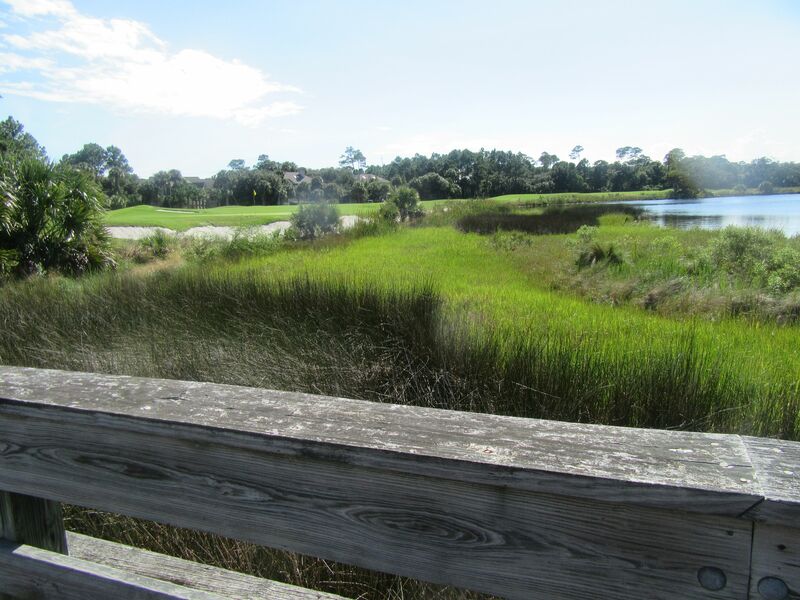 As Tom, who lives on the course with his wife, told me, the resort is adamant that homes fit well with the natural setting and do not create an eyesore to golfers – both from the courses and roads. The third is an absolutely gorgeous par three. 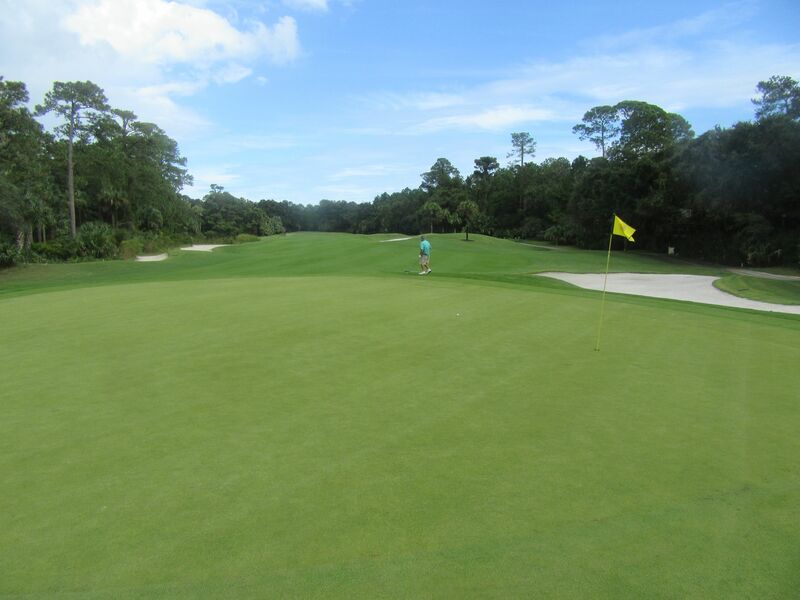 Playing over a humongous swampland, the green is tremendously wide from left to right and wasteland impedes almost up to the green. 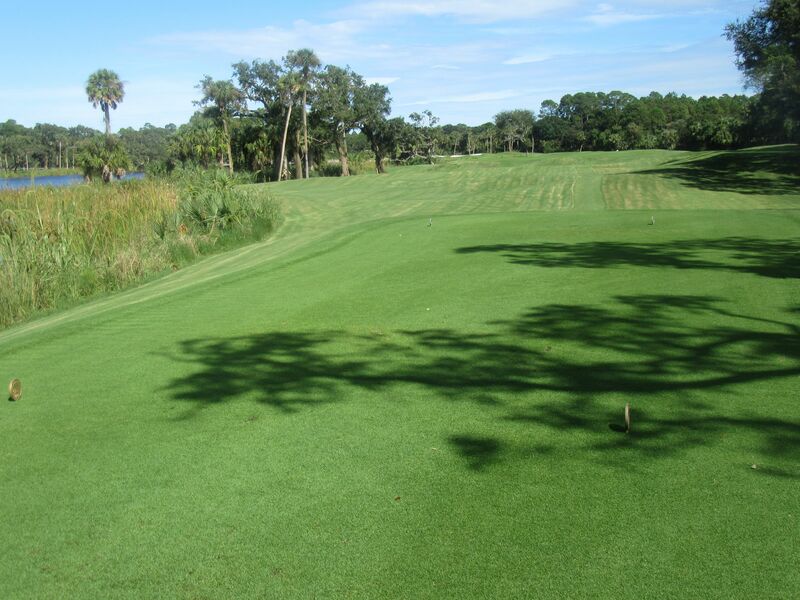 Following the water hazard is tall, tall grass, then a narrow strip of sand that runs the width of the green. With the hole location front-left, it was not the best time to push a shot right. My tee shot found the front-right of the green, though, and a good putt over the fringe on the left side of the green left me a make-able eight foot par putt. 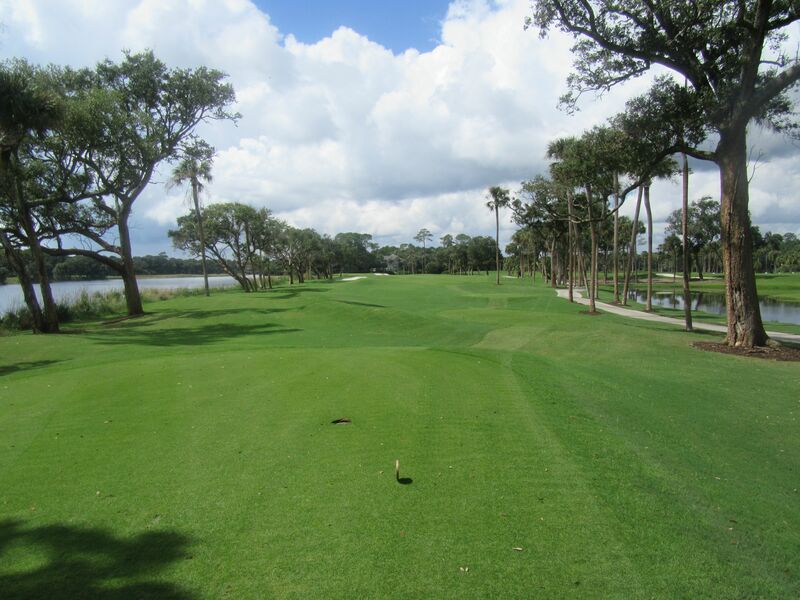 The fourth hole at Osprey Point is a narrow par four between trees. 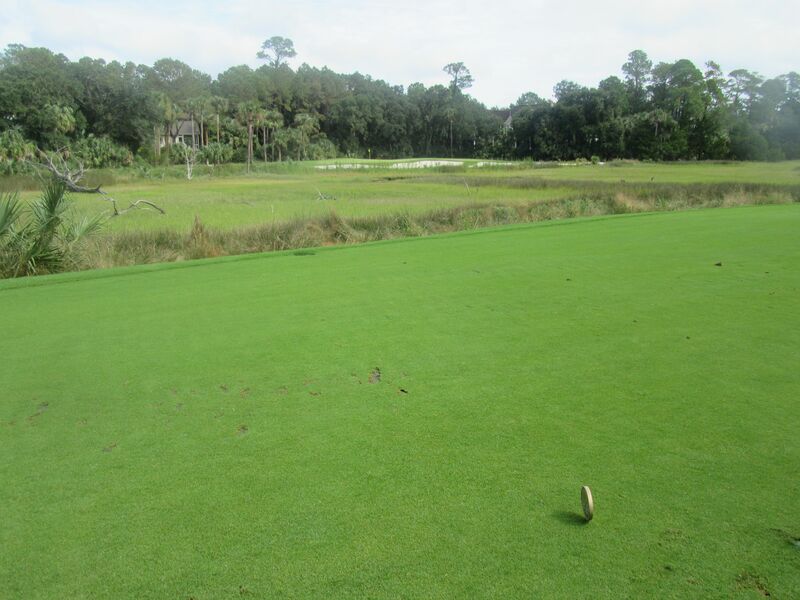 At 413 yards from the first tees in (I was playing the Osprey tees), the drive needs to be straight. 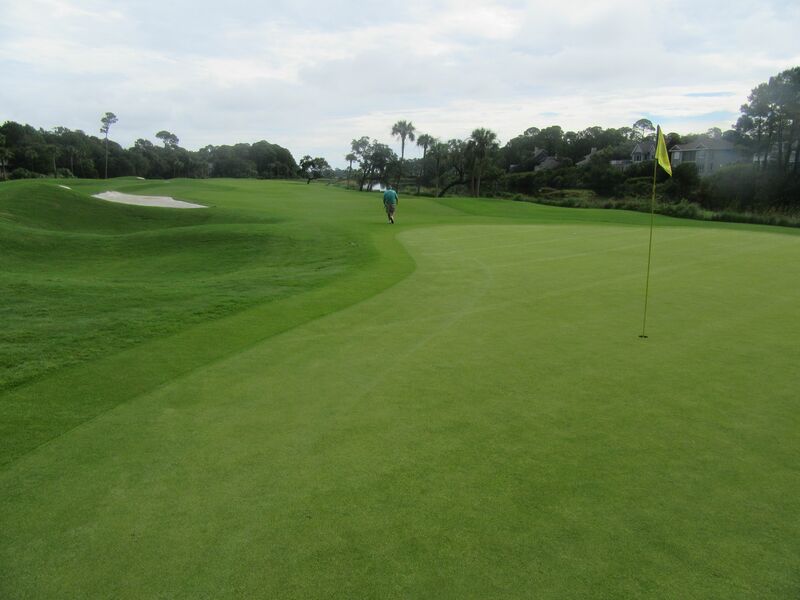 The green complex on four is really nicely done, with sand traps left and right on a faintly elevated green complex. 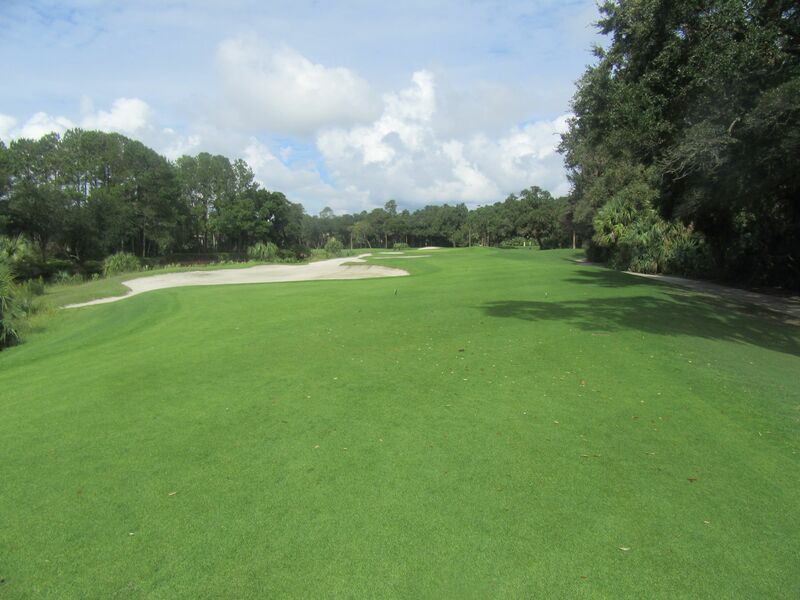 The fifth is a dogleg right par four teeing up from 380 yards from the Osprey tees. The first part of the fairway is actually pretty generous, although it gets much narrower for anyone trying to get greedy off the tee. There is some terrific mounding on the second half of the fifth’s fairway, leading up to a large green-side bunker short-right of the left-to-right sloped putting surface. Six is a fun par three. 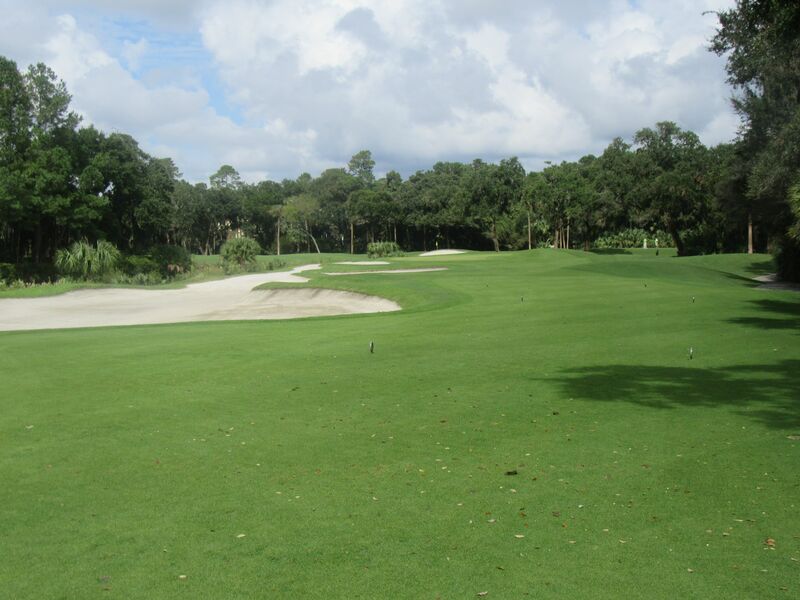 Lengthy from the back tees, the sand areas on the left are intimidating but should not come in to play… Neither should all the water left of those traps. 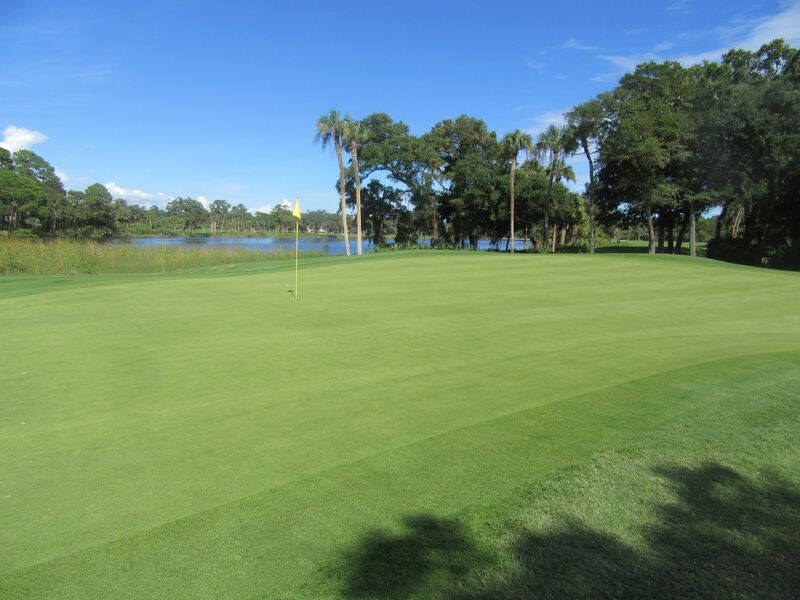 The safe play is to the right side of the green, although missing right will result in a recovery shot below the putting surface. 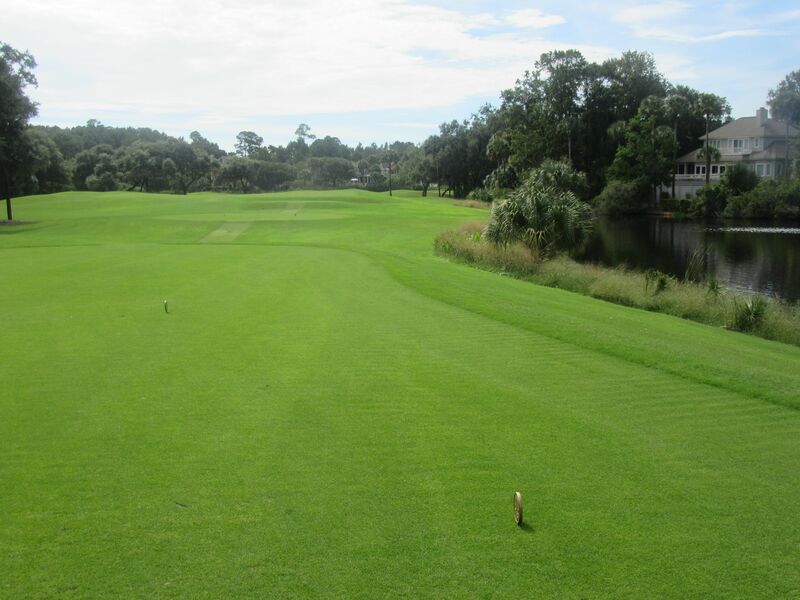 The seventh at Osprey Point is a short, almost drivable par four of 325 yards from the Osprey tees. A massive fairway bunker down the right side is the key hazard to avoid off the tee, followed by another big bunker that haunts the front-left side of the green and is in play for any approach shot starting left of the fairway trap. This is the shortest par four on the course, but these two traps create plenty of havoc to keep the hole from being anything but simple. 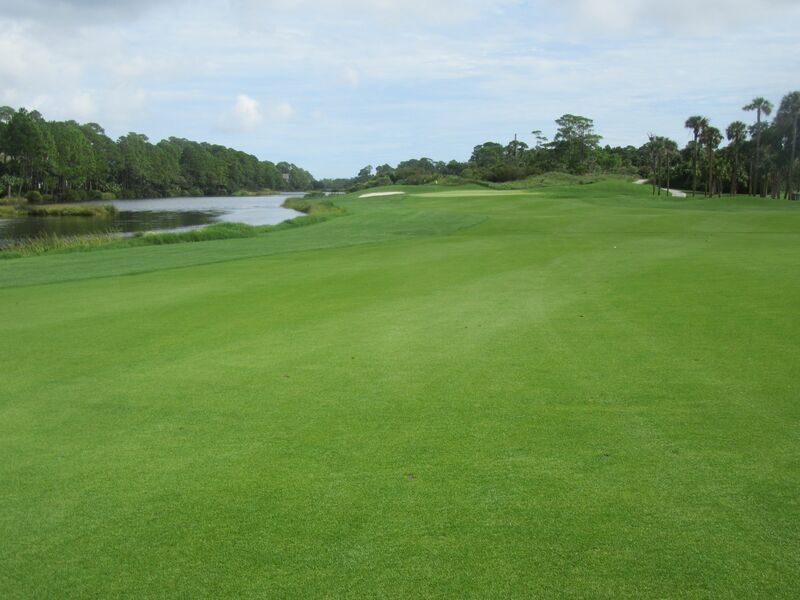 A long par five, the eighth plays straight out for about 400 yards before turning slightly left. Play the setup shot toward the right side of the fairway to create the ideal angle in to the risen green. 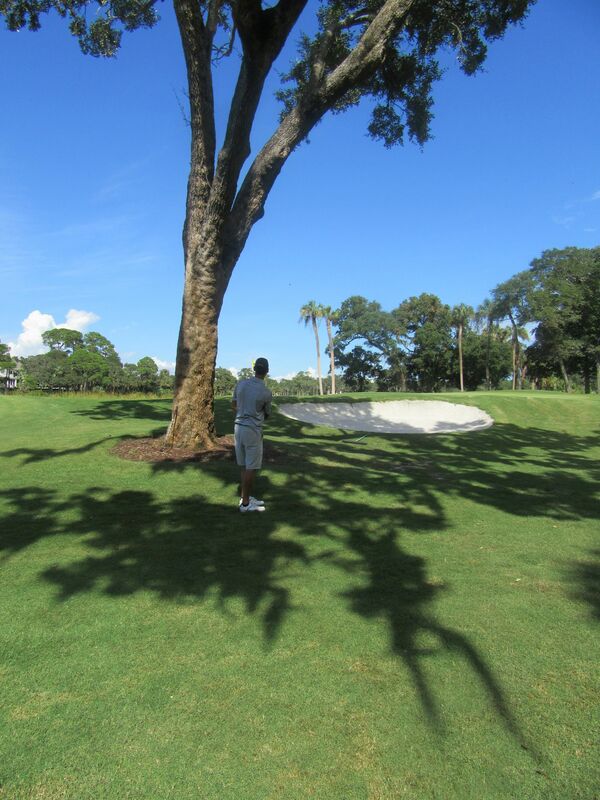 A big tree lives short-right of the green. Along with a smaller trap in front and a big bunker left, this is a challenging putting surface to hit in two. Nine is a fantastic risk/reward par four golf hole. 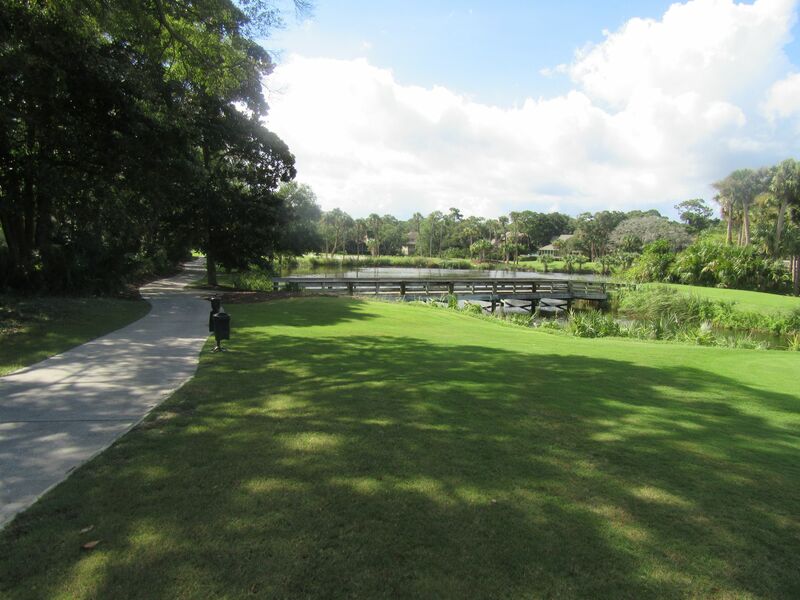 A massive pond runs the left side of the fairway, and needs to be carried off the tee. 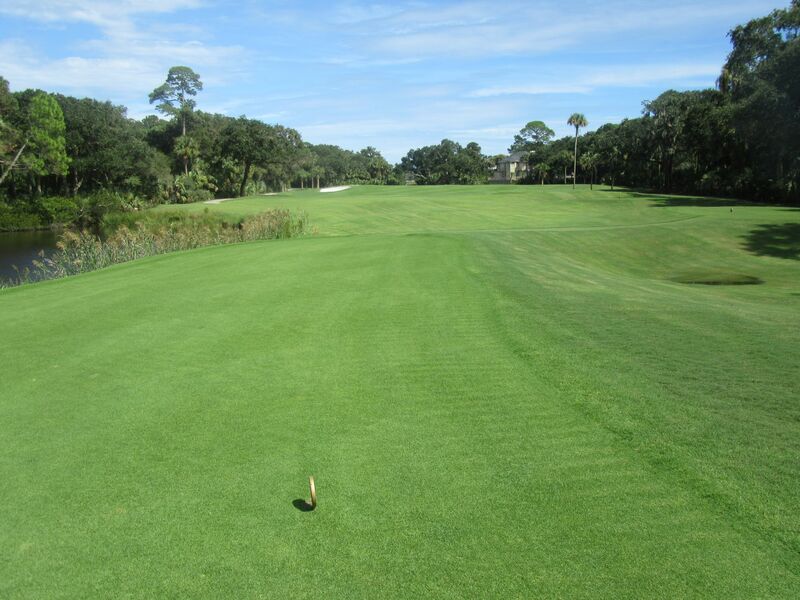 Long hitters can cut off a lot of distance on this hole, but obviously take on the hazard and a chance of hitting three off the tee. 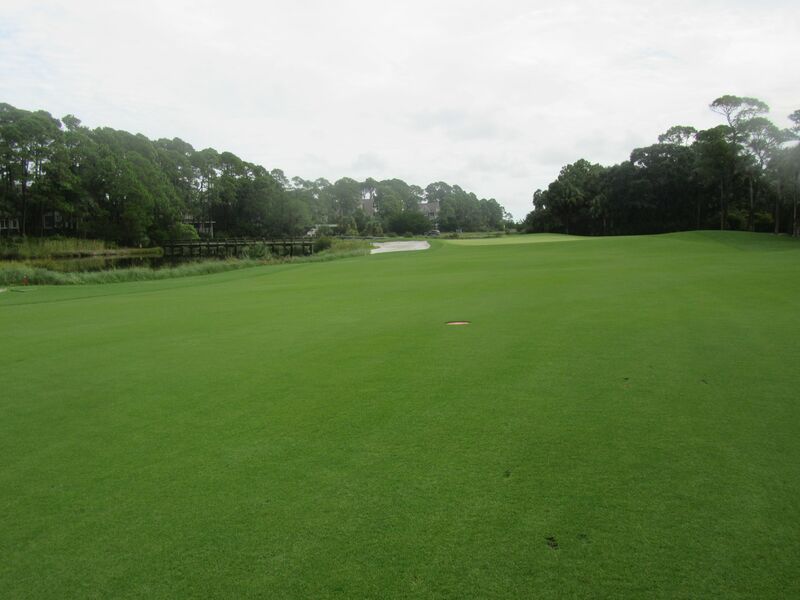 The green on nine is very narrow, with water left and deep traps front-right. I had a really nice drive on this hole, then completely shanked my second shot almost in to the driving range. My third shot was close and I narrowly missed a long putt for par. This is a great par four that will make any player consider strategy [and the current state of their game] before teeing off. Being out in the sun playing golf for hours can work up an appetite, and lucky for us they have a nice halfway house/snack shop on the lower level of the clubhouse at Osprey Point. Being from Wisconsin, bratwursts are always a great choice for lunch. Seeing as my wife manages corporate public relations for Johnsonville Sausage, if they carried any other brand we would’ve probably gone hungry. Thankfully, Kiawah Island carries the good stuff! The tenth is a straightaway par four with a really tricky green. 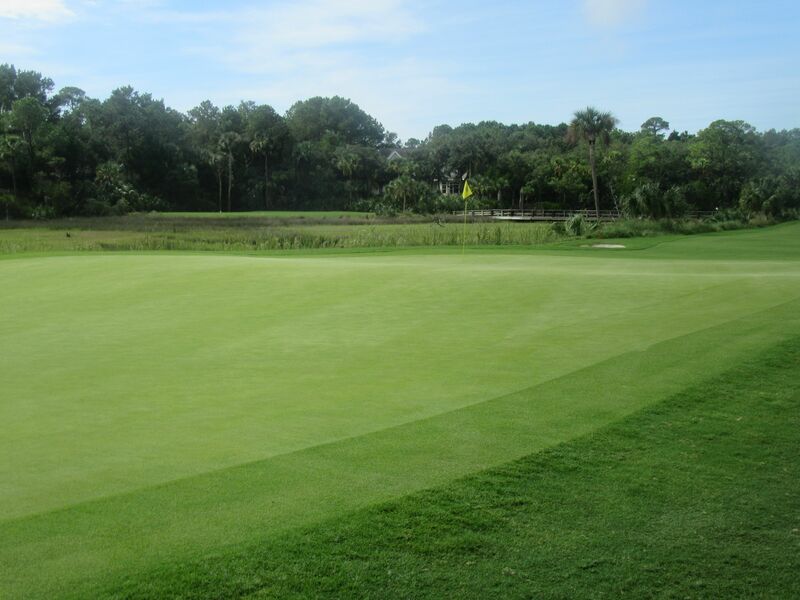 Water borders the left and right sides the entire length of the hole, and the green is short from front to back with two deep traps front-right. 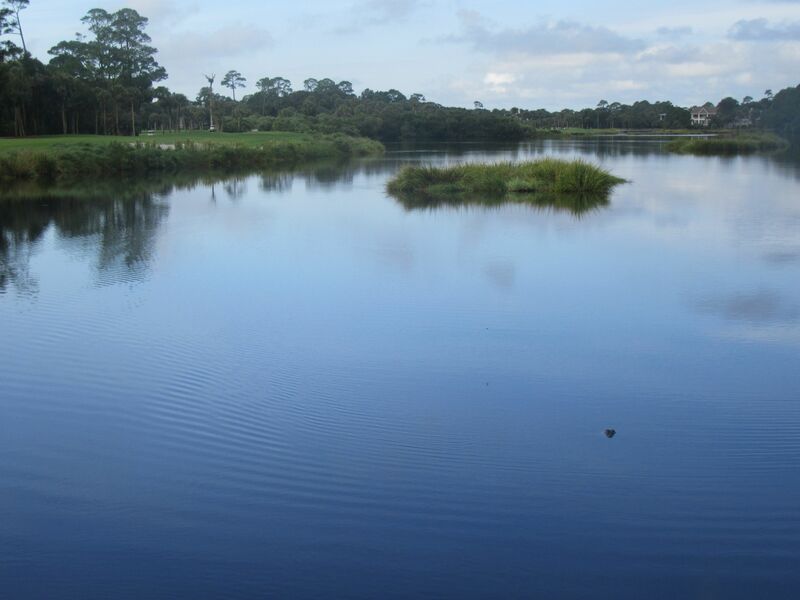 Eleven is an awesome par three over water. The green is closest to the tee boxes on the right side, but with a back-left pin on the widest putting complex on the entire course, there was no bailing out for this guy. I actually hit a really nice shot on this hole, making for my only birdie of the round. 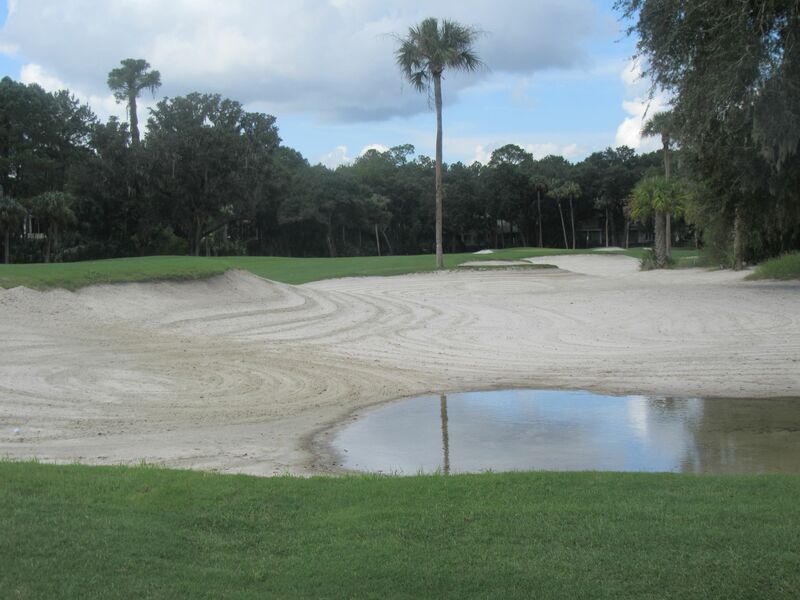 The green here runs hard from the back toward the water, and a narrow sand trap acts as a collection area buffering between the putting surface and the pond. 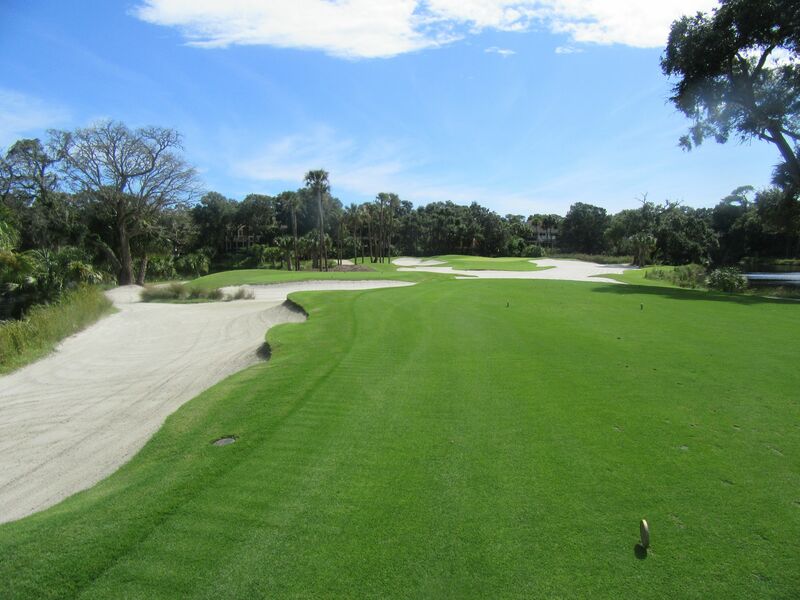 The twelfth is a dogleg right par five that plays around a gigantic fairway bunker at its elbow. 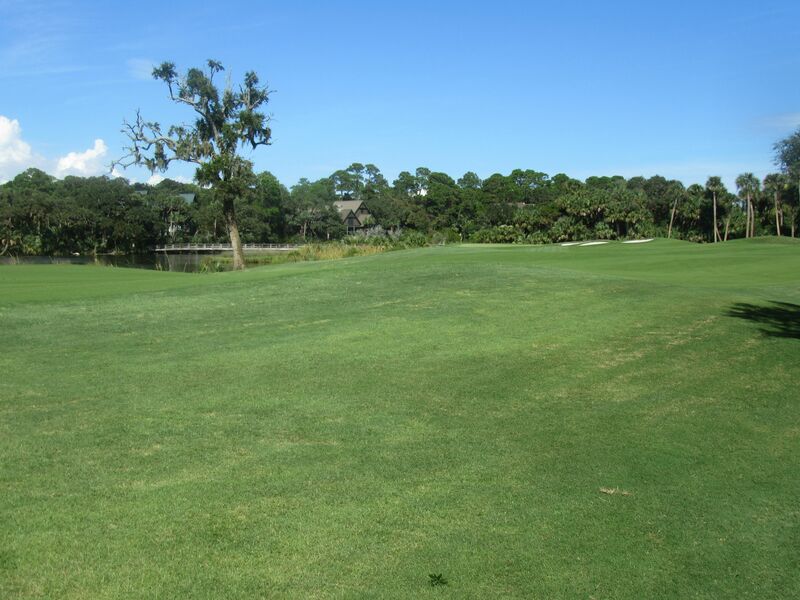 This trap runs from the elbow most of the way toward the green, so if you find it just make sure to get the ball out for a chance to hit this green in three. 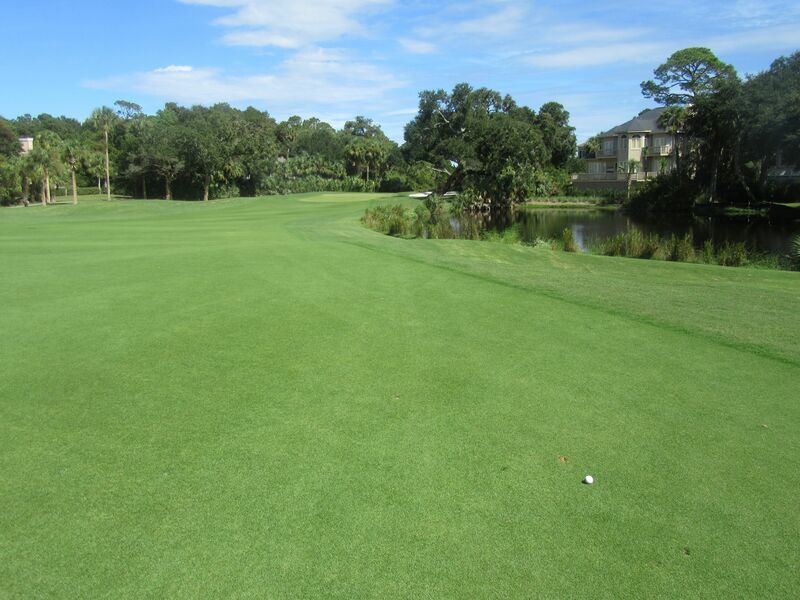 The green runs away from the fairway, but there’s nothing in front making this a reachable par five for long hitters. A trio of green-side traps abound both left and right. 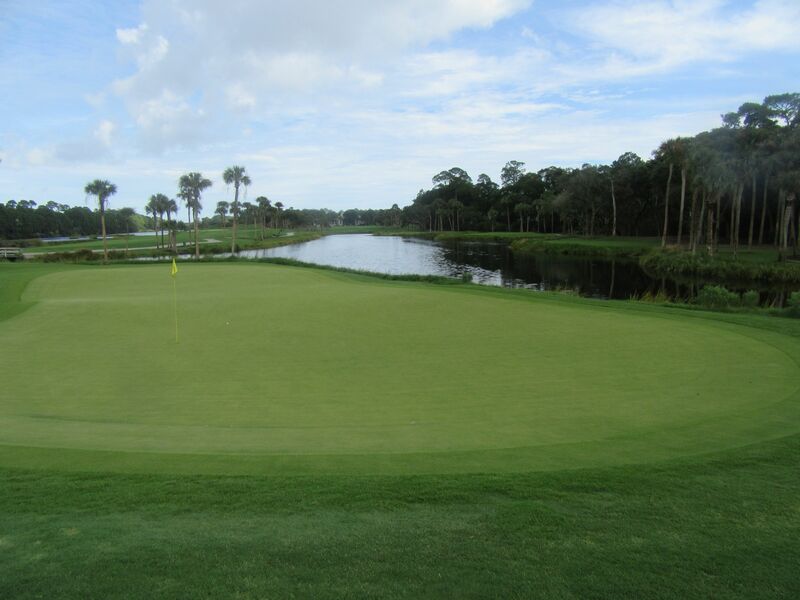 Thirteen is the first of two back-to-back short par fours, measuring just 323 yards from the Osprey tees. 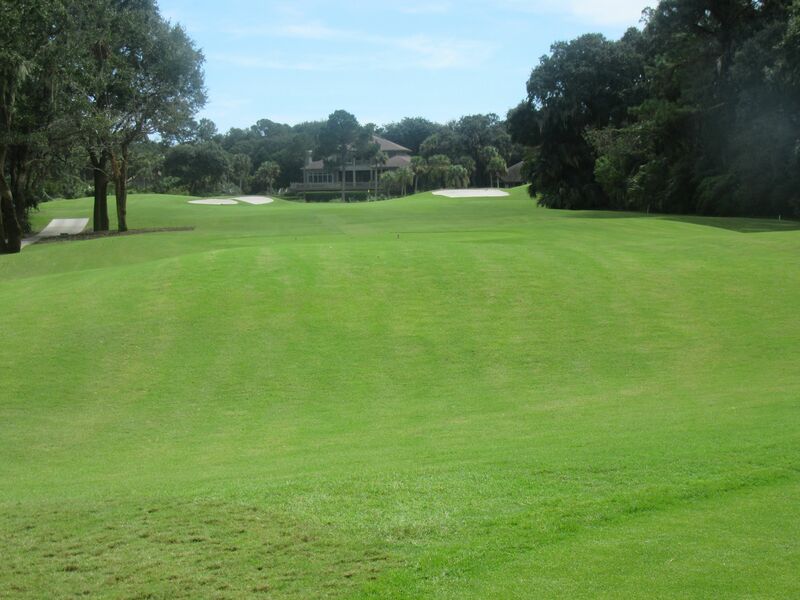 Unseen in the below photo, there is a fairway bunker at around 225 yards on the left side of the target area, which if flown will allow tee shots to bound toward the right and slightly downhill. 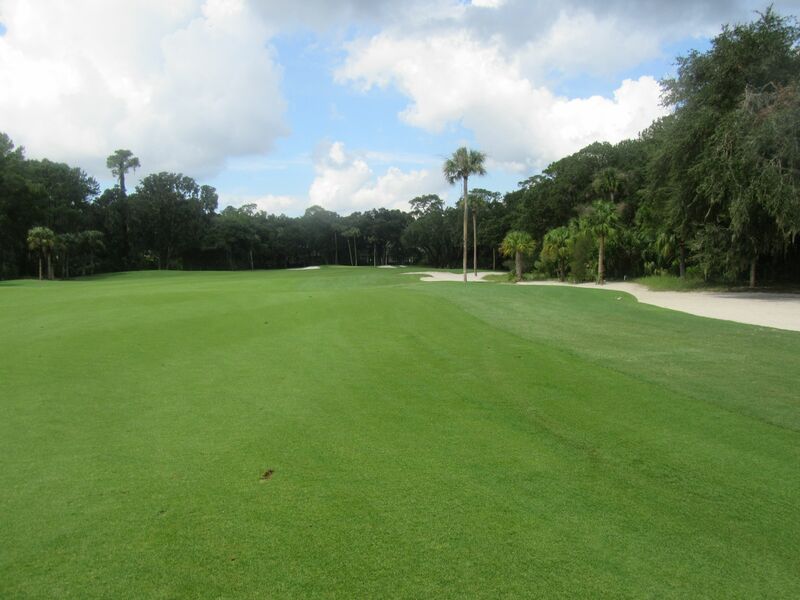 The green here is risen with a sizable sand trap on the left, and a sloped collection area on the right. 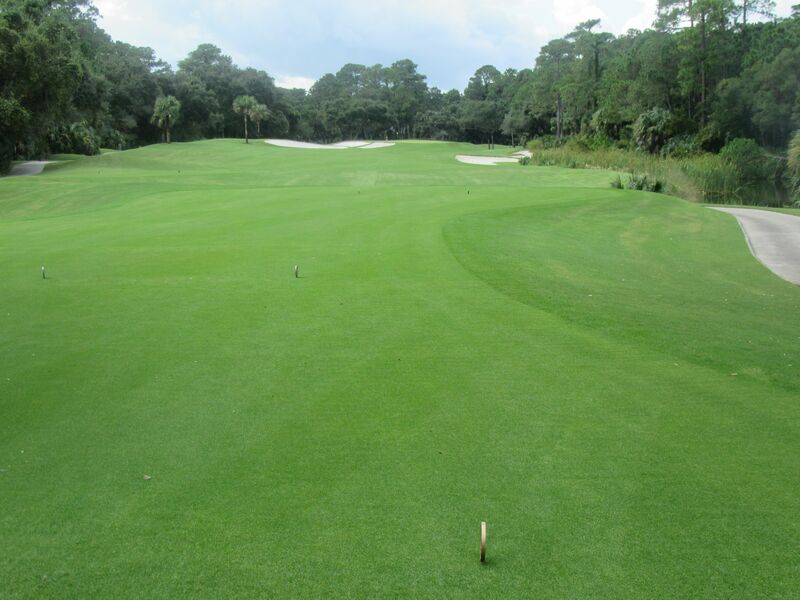 The fourteenth has a thin driving area and one of the shallowest greens at Osprey Point. The traps that narrow the target area come in to play around 240 yards, making players decide between driver or long iron off the tee. 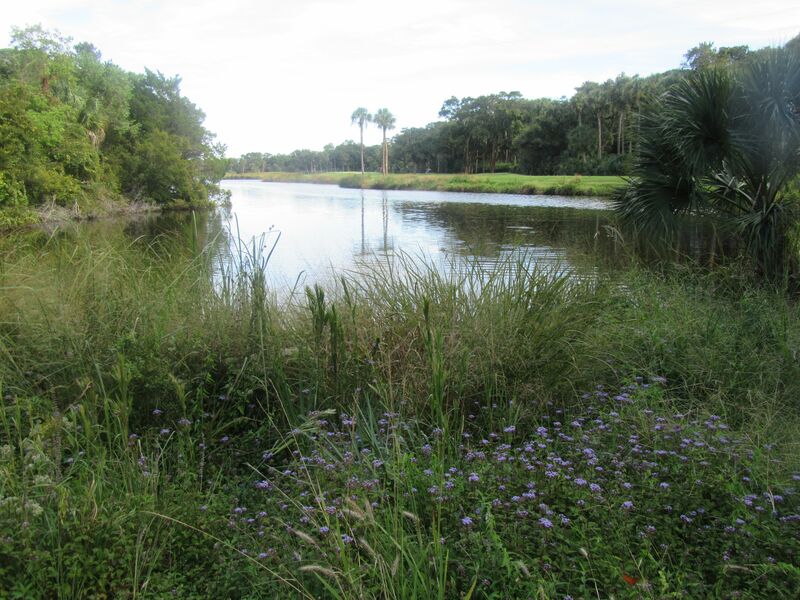 A large pond (thoroughfare?) 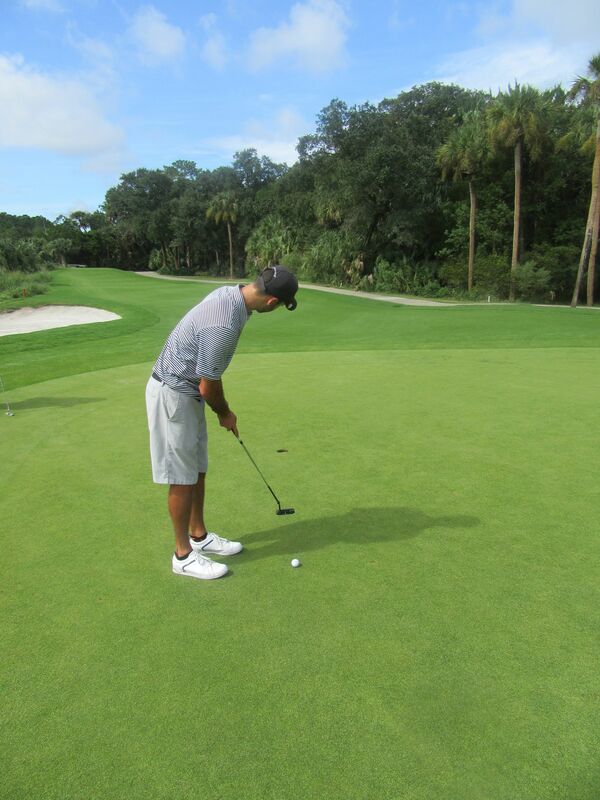 backs up the putting surface, making distance control key to the approach shot. 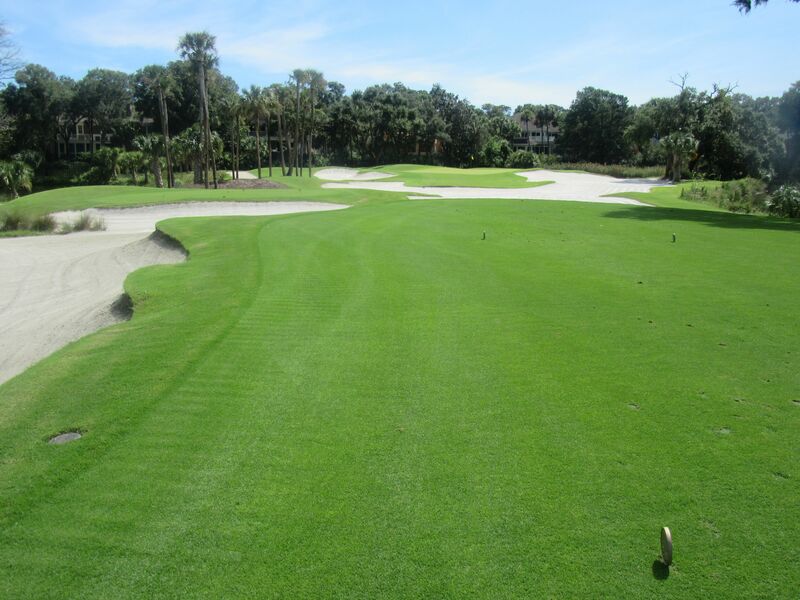 While a sea of sand dominates the eye on the short par three fifteenth, the tough two-tiered green complex is the aspect of this hole that should demand most of players’ attention. With a front pin, I hit the back and struggled to three-putt. 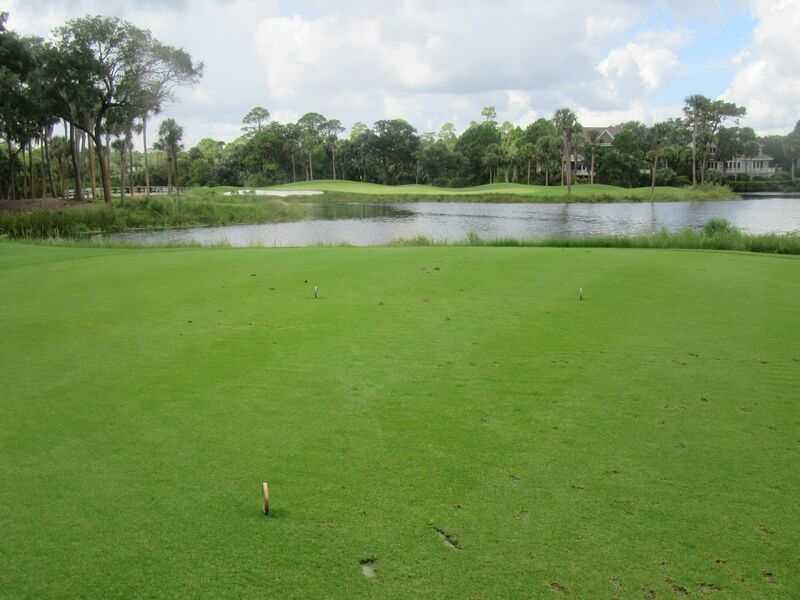 Sixteen is a really pretty par four with a pond certainly reachable from all the tees right of the driving area. The green on sixteen is very narrow, but deep. 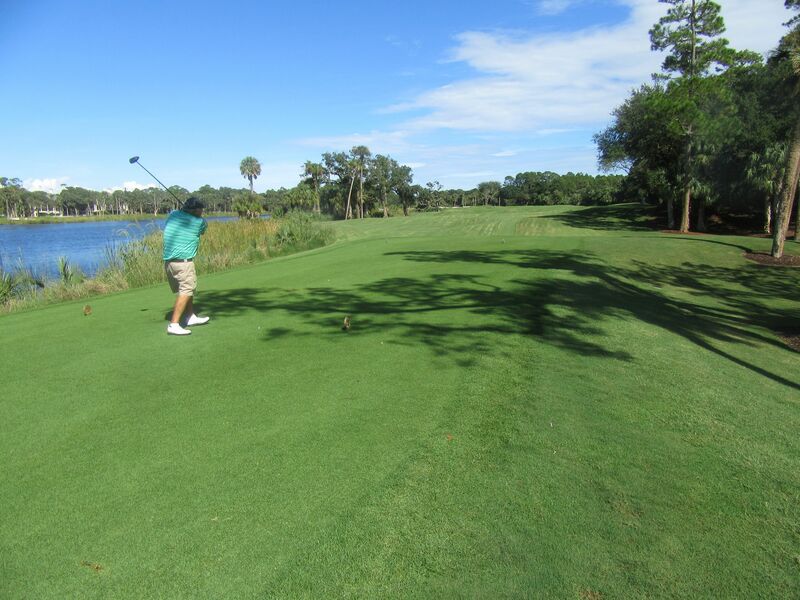 Breaching the crest of this fairway, a beautiful vista overwhelms beyond the green and over the Canvasback Pond that comes in to play on the course’s two finishing holes. 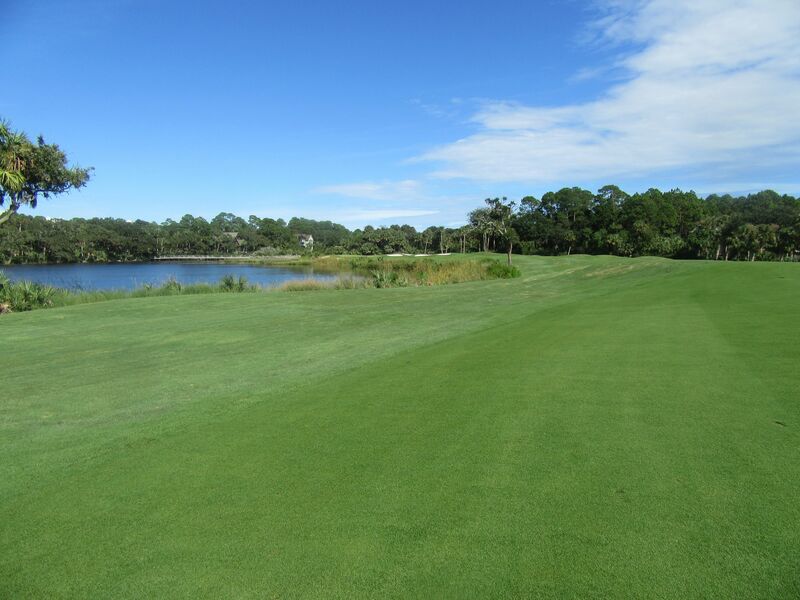 A long par four that plays 390 yards from the Osprey tees (412 from the tournament ones), the fairway on seventeen is narrow for about 200 yards before opening up at a bend in the Canvasback Pond. 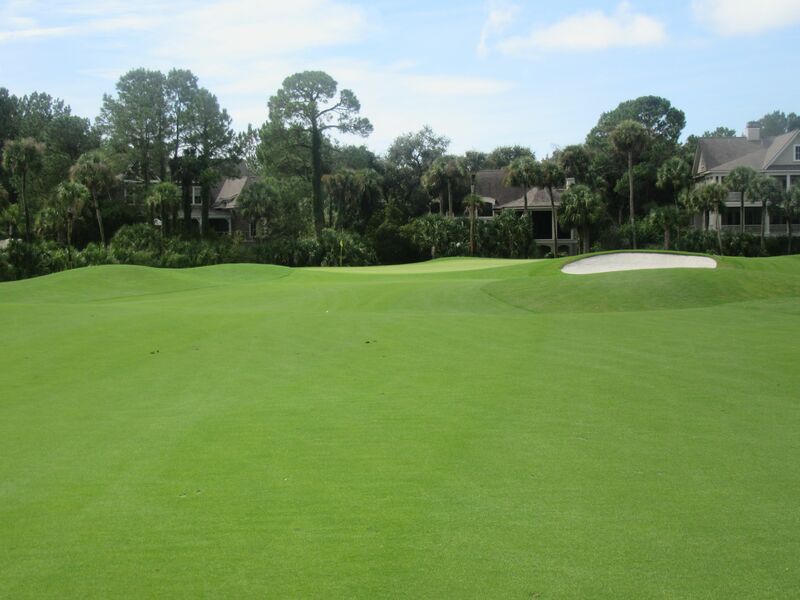 The left to middle sections of the fairway are ideal off the tee, allowing an approach shot that can avoid the deep bunkers short-right and right of the seventeenth’s green complex. 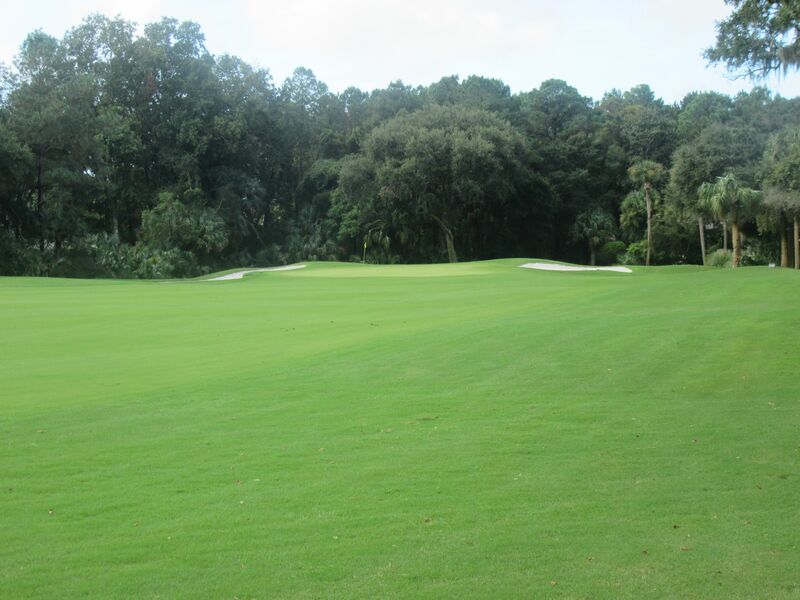 Osprey Point ends with a fantastic par five with trouble lurking everywhere. 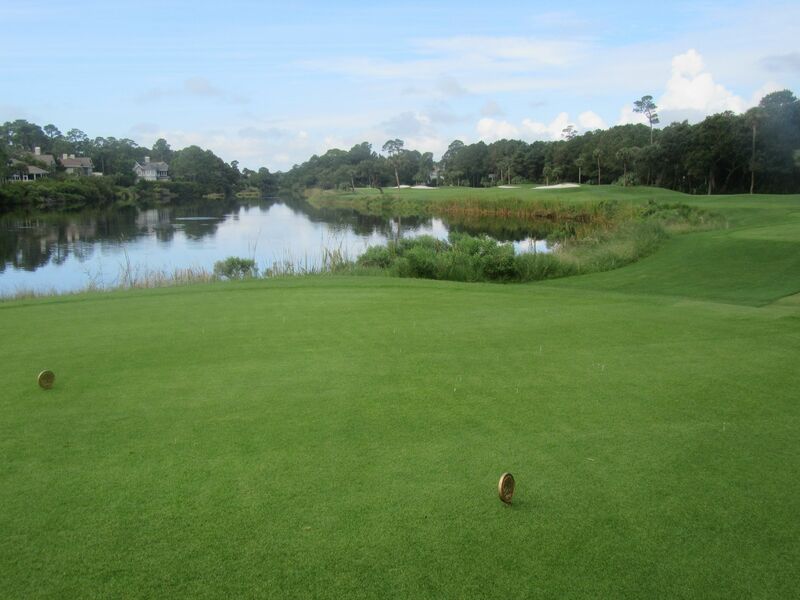 The fairway narrows considerably around 300 yards off the tee (from the Osprey tees), then plays over a long shoulder in the Canvasback Pond that makes going for it in two a tremendous challenge. “I didn’t come here to lay up on eighteen,” I told Kelly and Tom. I smashed a hybrid over the pond, and it of course found water left of the green. Lesson learned. A more disciplined approach would be the smarter play on eighteen, dissecting the hole shot-by-shot. The drive, if in the fairway, for example, should then be played toward but short of the duo of fairway bunkers that lead up to the green. A six- or seven-iron would have achieved that from where I started out, and would have probably resulted in a better score. 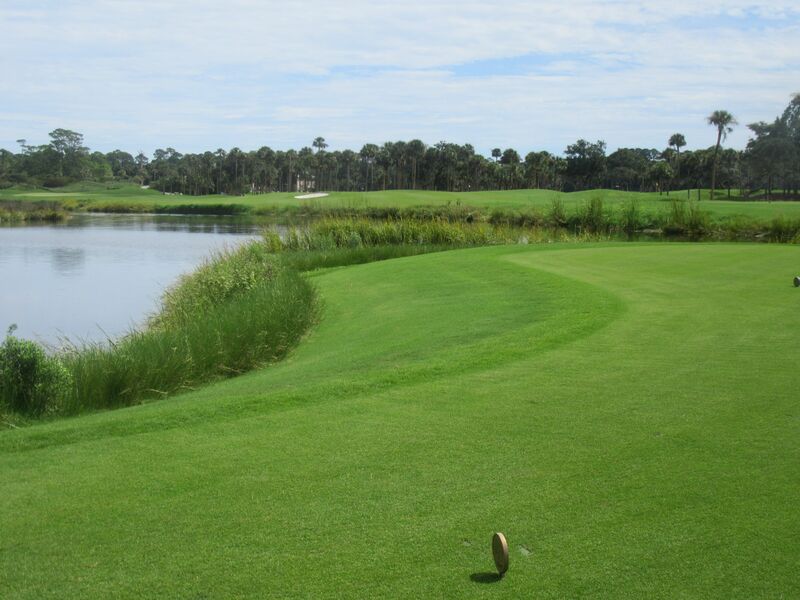 Eighteen is a gorgeous golf hole, and one that is certainly worthy of being the finishing hole on a wonderful Fazio track. 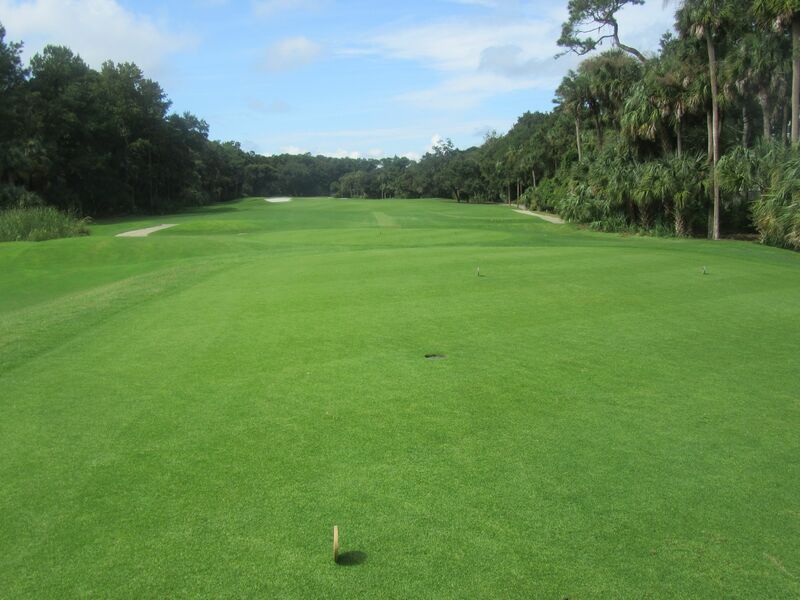 The Ocean course obviously dominates golf gurus’ talk about Kiawah Island, but having played Osprey Point and seen a bit of the other courses on the island I can say that Kiawah Island is a fantastic golfing destination for playing a lot of rounds and staying on-site. Kelly and I are already excited to get back to South Carolina, hopefully for our one-year anniversary, and a trip to Kiawah Island will of course be in the books. 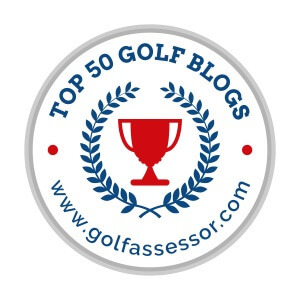 Now, let me say a couple of things about Tom Fazio golf courses. Fazio does not create the flashy course designs that Coore/Crenshaw, Dye and others do, but where he absolutely excels is in creating solid tracks that are playable for golfers of all skill levels, laying out terrific bunkering and varied green complexes, and maximizing the land he has to use to create a feeling of being “Out there” – very few of his golf holes I have played are visible from others. 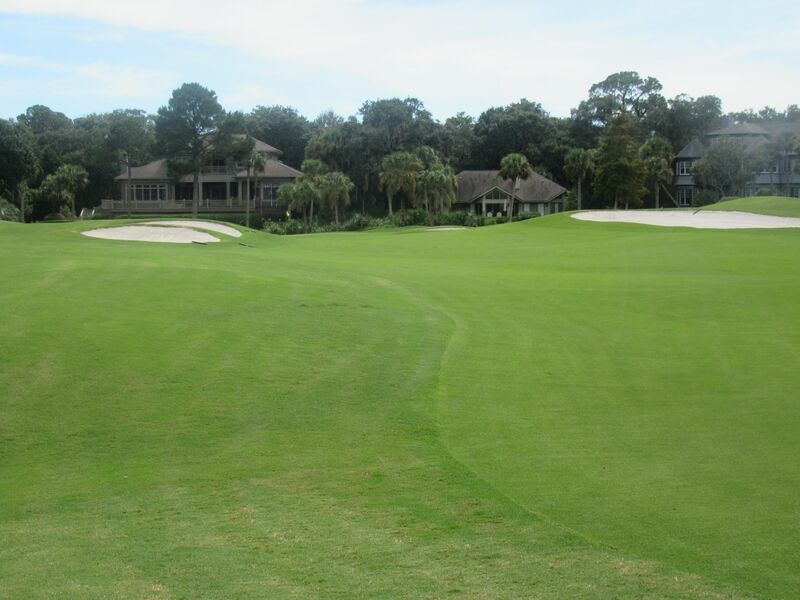 These are just a few of the things he did very right at Osprey Point. 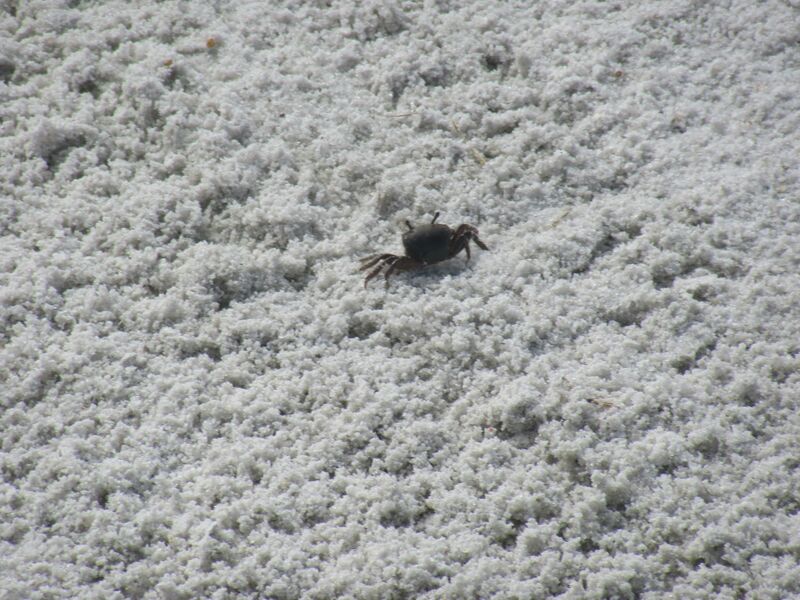 Looks awesome, Paul, I would love to get down there for a golf trip! Glad you enjoyed your time in SC. Looking forward to more write-ups. If you find yourself in the Northwestern corner of the state, look me up! 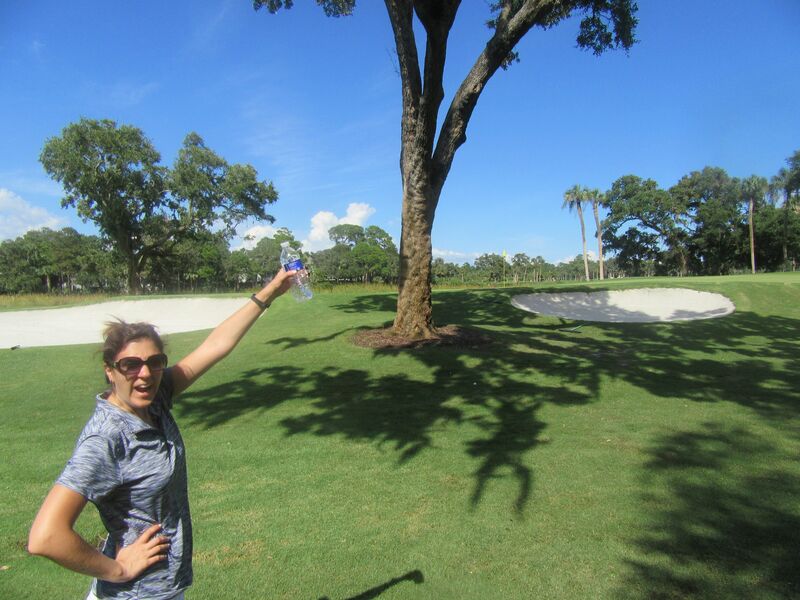 I am glad that Kelly and you enjoyed the island and your golf at Kiawah. It was a pleasure playing with you and am glad that Kelly was able to have a Johnsonville bratwurst at the snack bar. Now that Turtle has reopened, you have to come back and play this course. I am sure that you will enjoy it. Also Cougar is being refurbished and will be ready in the fall of 2017. Good luck to Kelly and you.